In considering perspective produced through cropping, a second possibility was to track the same event but shift the reader’s perspective to consider what was happening from the staff’s perspective and then try another transcript which switched to the customer’s perspective. The restriction continuing to be that there is only one camera angle. In the first transcript, with the focus on the staff, the customers come to one of the counter staff’s attention, as standing in a space where the customers are potentially getting ready to pay, so staff member readies the bill. 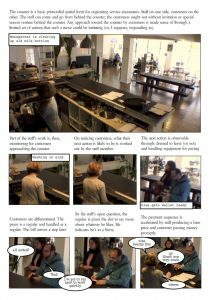 To orient the reader toward the staff’s perspective, the image is cropped to show the waitress and her actions behind the counter. In the second transcript, made after the first, the reader is oriented toward the customers’ perspective through cropping. The shift in perspective was one that then also pushed my analytic interest toward considering more closely what was happening with the customers and realising that their problem was around who and where to pay. They were orienting toward one member of staff serving tables in the distance (whose attention was not on them) and the other members of staff behind the counter (whose attention was not on the customers either when they initially look around). To show this problem also shifted what was transcribed in detail from the later part of the events (which was documented for the staff) to the earlier part of the events. In the second transcript, in a further attempt to translate textual conventions into the comic form, simultaneous events were framed with thick black panel borders and a running caption box whose text was centre-justified.